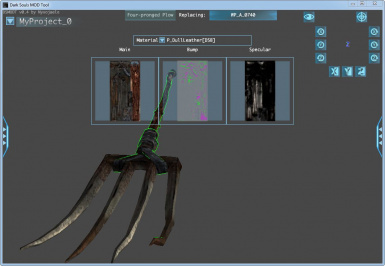 A general purpose asset viewer/editor for Dark Souls. Can view all maps, characters/NPCs, and object/props. Can edit meshes and textures for weapons only, at this time. 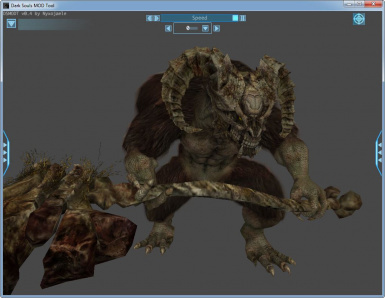 This is the "weapon-edit" release of my Dark Souls Modding Tool, DSMODT. This tool is being provided "as-is" with no promise that it will work in any way whatsoever, for any purpose. 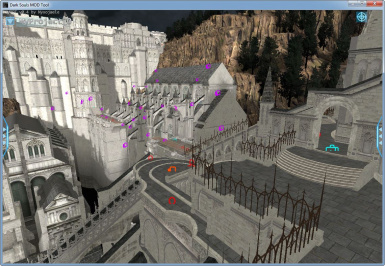 Some of the graphics shown on the DSMODT UIs may appear to be the same as the graphics shown on some of the UIs in Dark Souls. THESE GRAPHICS ARE NOT DISTRIBUTED AS A PART OF THIS APPLICATION! DSMODT reads these graphics from the installed copy of the game and applies them to the DSMODT UI elements during startup. ** All pieces are put together- on a rare occassion, this can cause some overlap, usually in areas where lower quality meshes were used when viewing a particular part of the map from a distance. ** Maps have icons marking the location of entities, objects, particle systems, audio sources, and a variety of other things. Low resolution textures and low LoDs (qualities) are showing in many areas of the maps. * I have no idea why this is there, but I manually looked at the file, and it actually does contain a copy there. In Firelink Shrine, there's a copy of some of the distance areas (under the fog) near the cemetary, floating below the original. * This is technically possible, and it was working in an older version, but most maps would cause DSMODT to run out of memory and crash, so it was removed for now. * I haven't dedicated the time to figure this out yet, but it should be possible in the future. * I don't know either. * This is a limitation in DSMODT - it just hasn't been programmed in yet. Modifying some weapons (ie. Abyss Greatsword) causes the in-game "swoosh" visuals to show up weird. * This is a lesser evil resulting from a hack that is in place until a real bone-mapping solution is implemented. Rest assured it's temporary. * This popped up unexpectedly recently. It will be fixed in a future release.